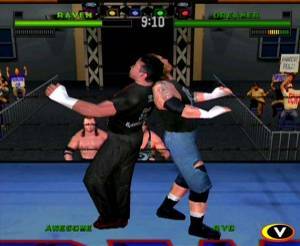 The Object of Body Slam: Super Pro Wrestling is to defeat your opponent in the ring. You must use strength, strategy, and a hint of sneakiness. Each match consists of a series of four-minute rounds. 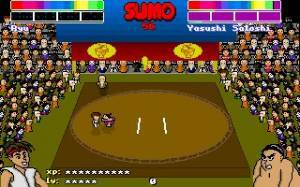 There is an unlimited number of rounds, so the match continues until a player wins or until a draw is declared. The first wrestler to pin his opponent to the mat for a time of 3 seconds is the winner. 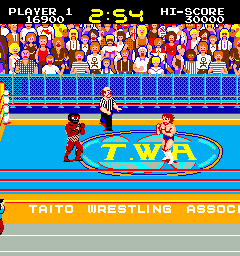 You control a wrestler selected from 12 different characters. Your opponent is controlled by another player or by the computer. 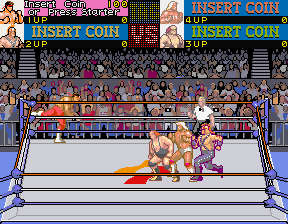 If you choose a Tag-Team Match you and your opponent each control 2 wrestlers who take turns in the ring.